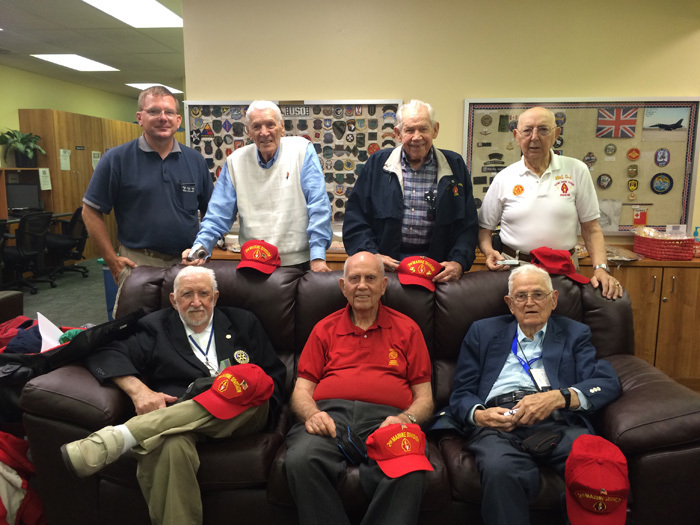 A memorable 2014 visit from six U.S.World War II veterans now has added poignancy as the Trust has learnt that four of the six men who called themselves “The Band of Brothers” have died over the past year. The group of Marines, then aged 88-93 all trained in New Zealand as part of the Second Marine Division – prior to fighting in the four-day Battle of Tarawa. They were all stationed in Camps in Kapiti and Porirua. In the past year veterans: Arvin J. Bowden, San Antonio, Texas; C.J. Daigle, Cincinnati, Ohio; James Morrow, Sommerville, South Carolina and C.; Dean Woodward, Pittsburg, Texas have all passed. The two remaining members of the group are Dean Ladd, Seattle, Washington; Wendell Perkins, Walnut Grove, California. Trust Chair Jenny Rowan says: It is incredibly sad to see these remarkable men pass on. They were all fantastic people and their life-long enthusiasm for New Zealand was heart-warming and inspiring. Our loving thoughts are with their families and loved ones. The Battle of Tarawa came at a considerable human cost with more than 5,000 Japanese and 1,000 U.S. lives lost. The Brothers leaving L.A. Airport on their way to New Zealand. Left to right (front row): Dean Woodward, Dean Ladd, A.J.Bowden. (Back Row): Tour leader Mark Noah, Jim Morrow, Wendell Perkins, A.J.Daigle. Original generation time 1.6313 seconds.